How do you start a successful cooperation between an University, Wikimedia and the Community of Wikipedians? You need the right people, shared interests, an opportunity and a little bit of good fortune. During the establishment of its programm the Collaborative Research Center ("Sonderforschungsbereich") 933 "Material Text Cultures" ("Materiale Textkulturen") of the German Research Foundation ("DFG"), located at the University of Heidelberg, commited itself to bring the results of its research to a wider public from the start. Wikipedia was identified and chosen as one of the major instruments of public outreach. 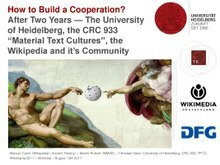 In fall 2015, a researcher of the CRC 933 came to the annual meetup of the German language Wikimedia community, “WikiCon”, held in Dresden to make contact with persons in the community that could help him getting started. Since then, there has been an intensive cooperation between the two institutions. It is nowadays one of the closest collaboration on the institutional level in the Wikimedia Community in Germany and was awarded with the "WikiEule" (“WikiOwl”) - the community award for volunteer engagement and contributions - for bringing academia and Wikipedia in contact with each other for this project. In Heidelberg we try different paths of cooperation in a coordinated approach and follow not just one idea. Members of the university and students are taught alike about Wikipedia - starting with the handling of the MediaWiki-Software, by learning about the community behind it and the organisational level like Wikimedia Foundation and Wikimedia Deutschland e.V. The Wikimedia comunity worked in edit-a-thons at GLAM on Tour stations on several topics closely together with institutions of the university including museums, libraries and public relations, engaging students, scientists and professional by showing how-it-is-done and asking questions to improve articles. At Wikimania, we will talk about this unique cooperation, the successes but also learnings. Participants are given new input on how to deal with academic institutions - and academic institutions how they could interact with Wikimedia projects and the Wikimedia community. This page was last edited on 16 August 2017, at 14:56.